Three teams were clear betting favorites entering the tournament. One of them went down to a 16-seed (Virginia), and the other two are in this tier. There isn’t much more that can be said about these two teams. Both teams quickly dispatched their first two opponents. Villanova held a slim lead against Alabama before Mikal Bridges erupted for 22 points in the second half. Duke bodied Rhode Island down low (Wendell Carter Jr. and Marvin Bagley III combined 14-16 shooting), and has won both of its games by over 20 points. Although they play completely different styles, both clubs have elite offenses with defenses that can clamp down when needed. Nova has the luxury of bringing a guy like Donte DiVincenzo off the bench, and a junior point guard like Jalen Brunson to lead them. Duke is the biggest team remaining. 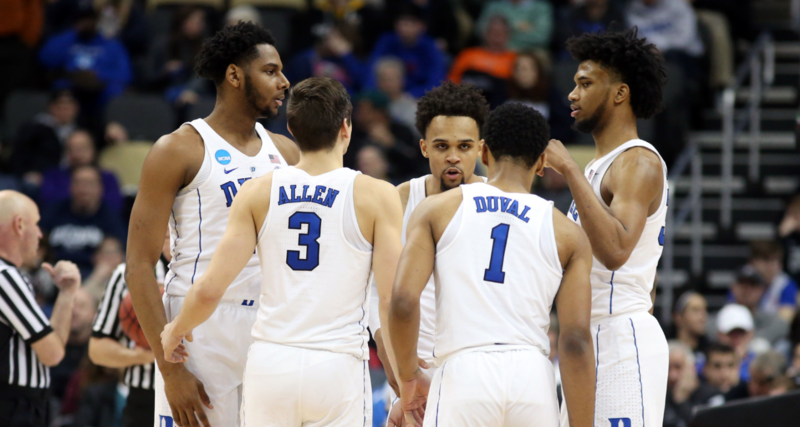 The Blue Devils use a smaller rotation that includes four freshmen and Grayson Allen. Either team is worthy of the National Title. Barring anything unforeseen, it looks likely that we’ll see these two titans match-up in the Final Four. There may not be two more polarizing teams in all of college basketball this year than Kansas and Kentucky. All year long the Jayhawks had to hear about their impending downfall in the Big 12. Teams like Oklahoma, West Virginia and Texas Tech were looking to end Kansas’ consecutive conference championship record. However, Bill Self and Devonte’ Graham weren’t ready for the streak to be over. Kansas entered the tournament white-hot, but have since cooled down after scares against Seton Hall and (gulp) Penn. Having a healthy Udoka Azubuike helps, but this team will go as far as the senior Graham takes them. Kentucky also entered the tourney with momentum after winning the SEC Tournament. John Calipari’s team of McDonald’s All-Americans vastly underachieved throughout the year, but have started clicking at the most opportune time. Among all of the five-star recruits, Kentucky has actually leaned on a four-star player — Canada’s Shai Gilgeous-Alexander — to lead the charge. Kevin Knox is feeling more comfortable in the offense, and they’ve also been getting contributions from sophomore Wenyen Gabriel and athletic freshman Hamidou Diallo. They’re arguably the most athletic team in the field. When Knox and Gilgeous-Alexander are knocking down shots, their offense becomes highly dynamic. You’re looking at the most likely match-up for the Regional Final out West. Neither team has played especially well thus far, but the Zags and the Wolverines have what it takes to make some serious noise in San Antonio. Both teams have exceptional depth across the board. Gonzaga brought back the majority of last year’s national title runner-up — minus Nigel Williams-Goss and Zach Collins. Losing two players to the NBA would typically cripple a team, but in this case, it’s allowed Mark Few to try and find contributions from other sources. Sophomores Rui Hachimura and Killian Tillie have flourished in their increased roles, and freshman stud Zach Norvell Jr. has been lights out in the tournament. Few knows what it takes to win in March, and Gonzaga possesses the experience and talent to make up for last year’s loss. The Wolverines needed a miracle shot to fall against Houston to make it to the Sweet 16. We’ve grown accustomed to John Beilein drawing up beautiful plays like the one he called for Jordan Poole to sink the game-winning three-pointer on Saturday. Beilein owns an impressive 21-11 record in the tournament, and is in prime position to make his first trip to the Final Four since 2013. Purdue’s title hopes were dashed by the news of Isaac Haas’ injury. The 7’2″ big man fractured his elbow against Cal State Fullerton in Purdue’s opening game, and will likely miss the rest of the tournament. Missing Haas might actually play to their benefit in certain match-ups, but a bigger opponent like Duke would absolutely crush Purdue on the boards. All-Big Ten first-team guard Carsen Edwards will need to play much better if the Boilermakers have any chance against the teams ranked listed above them. Standing in Purdue’s way of the Elite Eight are the pesky Red Raiders of Texas Tech. Tech has been trailing at halftime in both of their games this tournament, and haven’t looked impressive overall. Everything good said about this team during the regular season remains true. They’re stout on defense, and Keenan Evans is one of the best guards in the nation. However, Florida had a couple of clean looks to potentially win their match-up on Saturday. Give Dakota Mathias the same shots Egor Koulechov was getting, and Texas Tech will be sent home. The Boilermakers and Red Raiders present the most intriguing of the Sweet 16 match-ups, as both squads appear to be at an equal level. Clemson is coming off shellacking Auburn by 31 points. It was virtually over by the end of the first half — a half Clemson ended on a 30-6 run. Senior guard Gabe DeVoe has been lighting it up through two games, putting up 22 points in each contest and shooting over 60-percent from the field. The biggest question moving forward revolves around whether Clemson’s offensive onslaught is sustainable. Through two games, Clemson is averaging over 80 points and have knocked down 16 triples. During the regular season, Clemson ranked 95th nationally in offensive rating and 86th in three point percentage. The former numbers reflect an elite offensive club, but the latter numbers imply that Clemson was an average offensive team throughout the entirety of the year. If DeVoe keeps shooting like this, the Tigers can give Kansas some serious problems. West Virginia is in the same boat as Clemson. Too many times we have seen a dangerous Mountaineers team eventually crumble in the tournament due to their lack of reliable offense. Jevon Carter is playing the best basketball of his career, but they lack play-making skills around him. If they want to make a run, they’ll need more from senior guard Daxter Miles Jr.
Each of these three teams beat either a 1-seed or a 2-seed to get here. A&M arguably possesses the best pair of wins of any team in the field. They defeated Providence in their opening game — a Friar team that had beaten Xavier and took Villanova to the brink in the Big East title game the week prior. The Aggies followed up that victory with an absolute trouncing of the defending champions on Sunday. North Carolina was beaten at their own game, as Texas A&M used their length to out-rebound the Tar Heels 50-36. Their bench has done virtually nothing (A&M starters have 138 of 159 points through two games), and the guards have been shooting out of their minds. A&M will be a tough match-up for anybody due to their overwhelming size and athleticism. Nevada has proven to be the comeback kings of the tourney. They’ve shown great resiliency after facing double-digit second half deficits in both games thus far. The Wolfpack posses a clear identity on the offensive end. Caleb Martin is a point forward that can knock down threes and create for others. His twin brother, Cody, is a defensive wiz that is coming off one of the best scoring performances of his career against Cincinnati. Kendall Stephens is a knockdown shooter that thrives coming off screens. Jordan Caroline is college basketball’s Draymond Green — an undersized 5 that does a bit of everything. They’re all 6’6″-6’7″, can handle the rock, and play unselfishly. Coach Eric Musselman has this team playing an exciting brand of basketball, and has been spot on with his in-game adjustments thus far. They can be exposed on the glass due to their lack of a legit big man, but their ability to score with anybody makes them a threat. Florida State was on the brink of elimination with ten minutes to go against Xavier on Sunday. Then, the Seminoles caught fire. Florida State outscored Xavier 29-12 in the last 9:40 of regulation — knocking down jump shots and getting out in transition when they pleased. The Musketeers simply couldn’t keep up with the speedier Seminoles, as a couple of late Trevon Bluiett turnovers eventually sealed the game. They’ve really only played two great halves of basketball in the tourney (first half against Mizzou, second half against Xavier). However, that’s all they’ve needed to secure a spot in the Sweet 16. Florida State lacks the top end talent of every other team left in the field, and doesn’t have a go-to scorer consistently creating opportunities in crunch time. This aspect limits their overall upside. 9-seeds are undefeated against 16-seeds in the NCAA Tournament thanks to Bruce Weber and the Kansas State Wildcats. It wasn’t the prettiest of performances, but Kansas State ended UMBC’s Cinderella run by executing down the stretch and holding the Retrievers to under 30-percent shooting from the field. Even with the convincing victory over Creighton and the squashing of anybody’s dreams of a 16-seed making the Final Four, it’s tough to place Kansas State in any single tier. Avoiding Virginia robbed them of any chance of earning the title of “Giant Killer”. And although there are question marks surrounding the health of leading scorer Dean Wade, Kansas State simply isn’t as talented as the other teams listed in that tier. As such, they’re given their own spot. They aren’t enough of an underdog to be a “Cinderella”, and not quite good enough to reach the next tier. The two double-digit seeds might be ranked at the bottom of this list, but don’t count either out just yet. With Virginia and Cincinnati being knocked out last weekend, it’s not absolutely ridiculous to believe the best remaining defense in the field belongs to Loyola-Chicago. The Ramblers are pests on the defensive end, and are able to create turnovers and contest at the rim without fouling. Offensively, they’ve been able to slow the tempo and work for good shots. 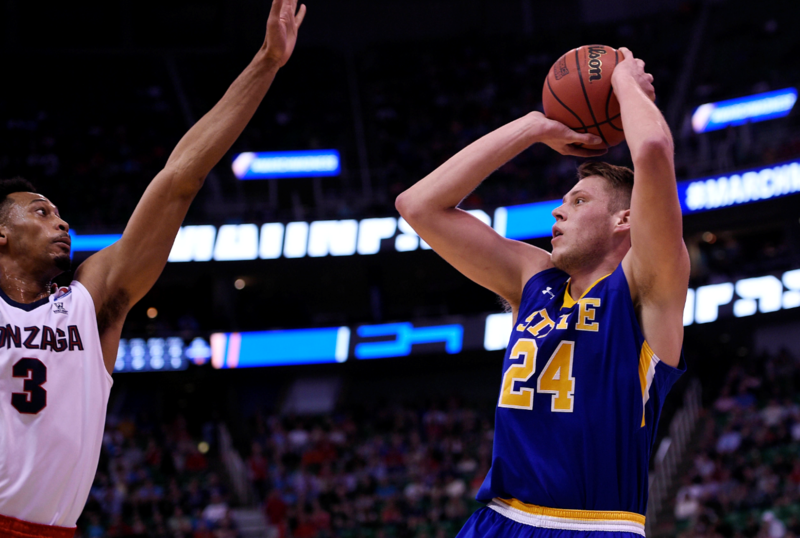 Sharpshooter Clayton Custer is nailing three-pointers at a 75-percent clip this postseason. The team as a whole is shooting over 48-percent from the field. They are a squad to be reckoned with, and have a legit shot at becoming the first double-digit seed to make the Final Four since VCU in 2011. The slipper still fits for Jim Boeheim and his Orange. Syracuse seems to be perpetually on the bubble by season’s end, narrowly making this year’s field after finishing in 10th place in the ACC. Whether they earned their spot in the play-in game is up for debate, but Syracuse has certainly looked the part through their three tournament games. Boeheim always has his team playing at their best in March, and this year has been no different. Opponents have looked lost against their zone, as Syracuse has been able to utilize their length and athleticism to disrupt passing lanes and force contested shots. However, their offense still leaves something to be desired after beating Michigan State with one made three and three total assists. Simply put, that lack of offensive output won’t cut it against Duke.